A little bird - or possibly a mole, we’re not too sure exactly which member of the animal kingdom it was – dropped us the first pics of one of MSI’s forthcoming micro-ATX motherboards, the H57M-ED65. This is the first board we've seen that will accept the upcoming 32nm Clarkdale processors which will likely be called Core i3. These are the first Intel processors that will integrate a GPU into the same packaging as the CPU, meaning that this is the first retail example of a Westmere platform to greet our eyes. Intel's timetable for Clarkdale isn't too clear, with some rumours that Clarkdale will be launched early in the final quarter of this year rather than the first of next. If that’s true, Intel is running out of time, and we’ll be working hard over Christmas. Our sources indicate that the processors should be out early next year. While this means a longer wait, at least us hard-working bit-techers will get a proper Christmas break. Yay! The MSI H57M-ED65: the board looks great, but we're going to have to get used to yet another chipset name! As the keen-eyed of you will have noticed, the board is very similar to existing P55 motherboards, particularly MSI’s P55-GD65. Beyond the colour scheme and style of heatsink, there’s only one chip of any significance - the chipset - that needs cooling. If MSI’s naming scheme is consistent, we can expect the new chipset to be named H57 rather than P55. 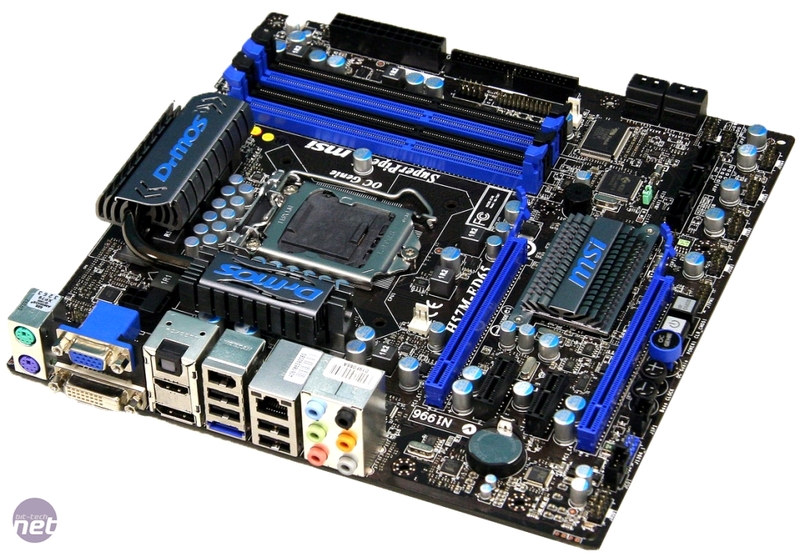 As with Lynnfield (LGA1156 Core i5/i7), expect Clarkdale CPUs to feature a built-in memory controller, so there's still no need for a Northbridge. As the board is intended for Westmere CPUs with integrated GPUs, there are multiple display outputs integrated into the rear I/O block. 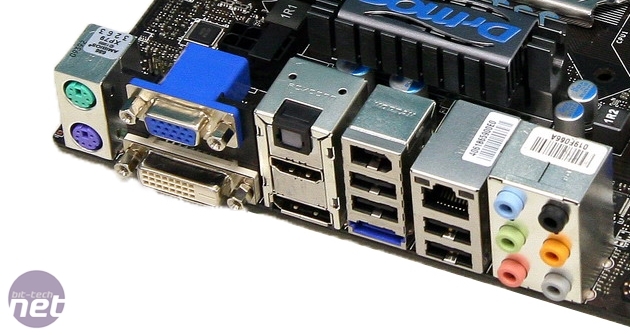 We doubt you'll be able to use all four of the DVI, D-Sub, DisplayPort and HDMI outputs concurrently (only ATI seems to have cracked that particular roasted chestnut at the moment with its EyeFinity technology). Instead, we'd expect that you can use two of your choosing. Turn the page for more photos and words. And we'll stop with the Christmas references too; it is only November, after all. With anticipation mounting higher than Everest, MSI and Lucid have big, bold performance statements to fill. With the ability to run a mix of different graphics cards together in multi-GPU setups, and promising performance better than what Nvidia and ATI offer - we put these claims to the test.